Looking for an elegant and cute PERSONALIZED hard-cover journal notebook that will inspire the most brilliant ideas for women? The Brilliant Ideas Journal Notebook features your custom name and is perfect for everyday note taking, scribbling or writing down ideas. A beautifully personalized journal for writing down all of your brilliant ideas! With its elegant and gorgeous design, this Blank Journal Notebook features your custom name along with the words "Brilliant Ideas". This journal book will become your constant companion and a prized possession that enriches your life and sparks your creativity. Use the Personalized Brilliant Ideas Writing Journal Notebook to record all of those dreams, feelings, creative ideas, or for everyday note-taking and is the perfect gift for girlfriends, daughters, sisters, friends, and teen girls. This blank lined journal notebook makes the perfect, one-of-a-kind birthday gift, Christmas gift, graduation gifts, back to school notebooks, Sweet 16 celebrations, and makes a wonderful keepsake gift she'll love and remember. 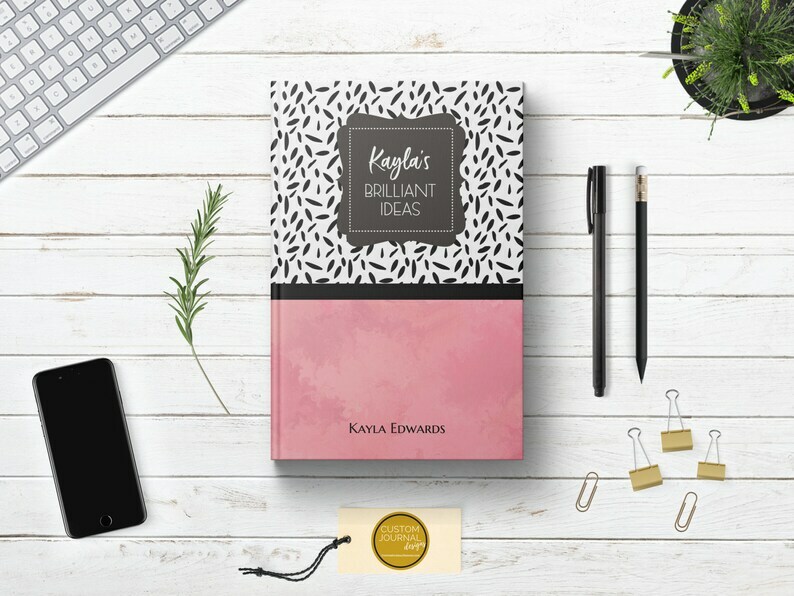 • Features your custom name along with the words "Brilliant Ideas" on the gorgeously designed black, white and pink watercolor cover.